Hi friends! I have a new crochet pattern today! 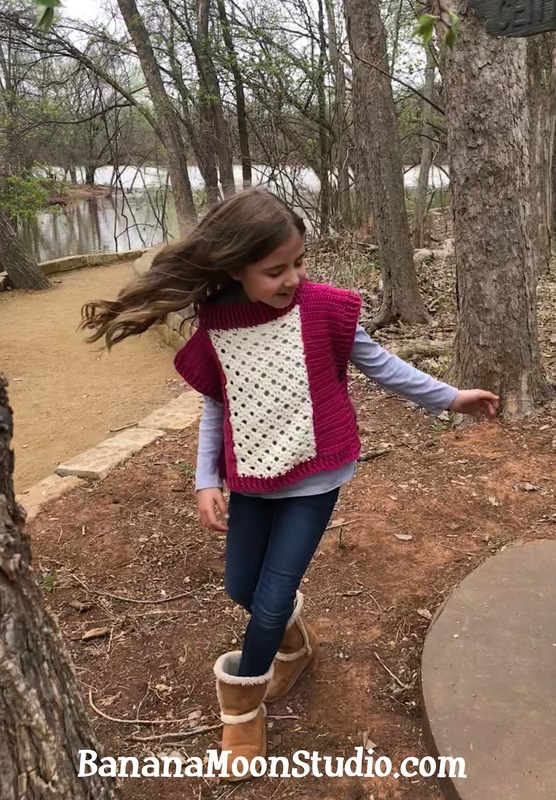 This a sweet girls poncho that I’ve named “Roland Poncho.” This pattern is only available right here on my blog. It is made in Universal Yarn Uptown DK, which is 100% Acrylic (aka, easy care) and SO soft! 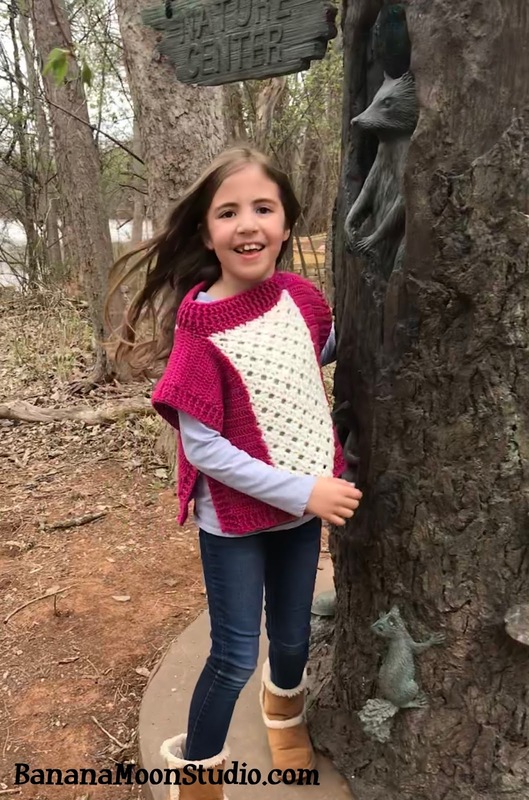 It’s a great yarn for kids’ projects! See below for shade numbers and amounts. In this pattern you start by making two long side panels that fold over the shoulder. Next, you make two center panels. These are sewn together, though you experienced crocheters could easily do something like intarsia to make the panels all in one piece. I didn’t make mine that way because I felt it would make the pattern a lot more complicated to write, and understand. Next you stitch on the edging and the collar. Lastly, you attach the buttons and weave in the ends. 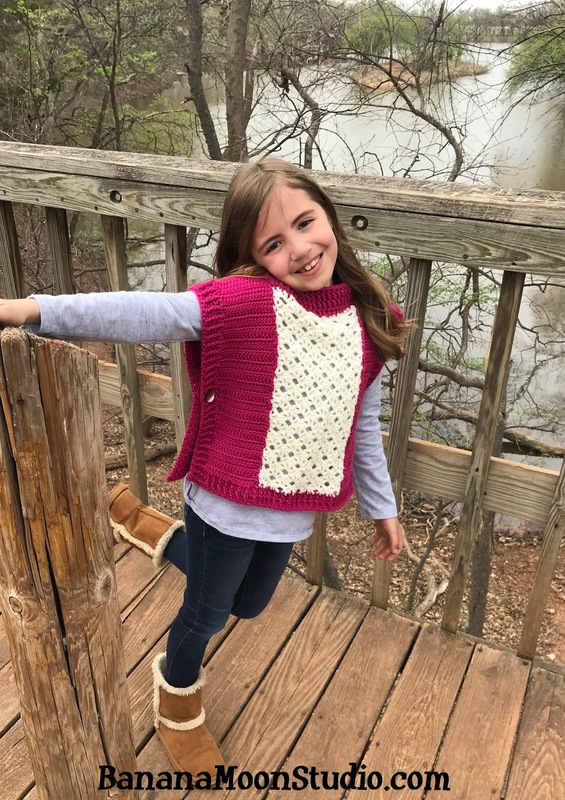 This will make such a fun and simple sweater for your daughters, granddaughters, nieces, and other favorites! Please click here to find and favorite the project on Ravelry. Included Sizes:Children’s sizes 2 [4, 6, 8, 10]. Finished Measurements: 24 ½ [26 ½, 28 ½, 30 ½, 31 ½]” chest circumference; 11 ½ [12 ¾, 13 ½, 15 ½, 17]” length. Yarn: UniversalYarn Uptown DK (100% Acrylic; 273 yds [249.5 m]; 3.5 oz [100 g]; CYCA weight: 3/light): #104 Bashful (MC), 2 skeins; #101 White (CC), 1 skein. Crochet Hook: H/8 [5 mm], or size needed to obtain gauge. Notions: Tapestry needle, four shank buttons about ¾” [2 cm] in diameter. Gauge: 17 sts x 12 rows = about 4” [10 cm] in Side Panel pattern st.
Row 1(WS): Sc in 2nd ch from st and each remaining ch, turn – 13 [15, 17, 16, 17] sts. Row 2: Ch 1, sc in each st, turn. Rows 3-4: Ch 2, dc in each st, turn. Repeat rows 2-5 for solid stitch pattern. Work in solid stitch pattern for 60 [68, 72, 84, 92] rows. Fasten off. With CC, ch 26 [26, 26, 32, 32]. Row 1(WS): Ch 1, sc in first ch, ch 1, sk next ch, *sc in next ch, ch 3, sk next ch, sc in next ch**, ch 3, sk 3 chs, repeat from * to last 2 chs, ending last repeat at **, ch 1, sk next ch, sc in last ch, turn – 10 [10, 10, 12, 12] sts. Row 2: Ch 1, sc in first st, *(dc, ch 1, dc, ch 1, dc, ch 1, dc) in next ch-3 sp**, working over next ch-3 sp, sc in middle ch of 3 skipped chs of foundation row, repeat from * to last st, ending last repeat at **, sc in last st, turn – 21[21, 21, 26, 26] sts. Row 3: Ch 4 (counts as dc, ch 1), sk first 2 sts, *sc in next ch sp, ch 3, sk 2 sts, sc in next ch sp**, ch 3, sk 3 sts, repeat from * to last 2 sts, ending last repeat at **, ch 1, sk next st, dc in last st, turn – 10 [10, 10, 12, 12] sts. Row 4: Ch 3, (dc, ch 1, dc) in first st, *working over next ch-3 sp, sc in middle ch sp of fan underneath**, (dc, ch 1, dc, ch 1, dc, ch 1, dc) in next ch-3 sp, repeat from * to last ch sp, ending last repeat at **, sk last ch sp, (dc, ch 1, 2 dc) in last st, turn – 22 [22, 22, 27, 27] sts. Row 5: Ch 1, sc in first st, ch 1, sk next st, *sc in next ch sp, ch 3, sk 3 sts, sc in next ch sp**, ch 3, sk 2 sts, repeat from * to last 2 sts, ending last repeat at **, ch 1, sk next st, sc in last st, turn – 10 [10, 10, 12, 12] sts. Row 6: Ch 1, sc in first st, *(dc, ch 1, dc, ch 1, dc, ch 1, dc) in next ch-3 sp**, working over next ch-3 sp, sc in middle ch sp of fan underneath, repeat from * to last st, ending last repeat at **, sc in last st, turn – 21[21, 21, 26, 26] sts. Repeat Rows 3-6 for pattern. Work in pattern for a total of 26 [30, 32, 40, 44] rows. Fasten off. Lay all pieces with RS up. Two side panels should be parallel and spread wide enough to just overlap edges of two center panels. 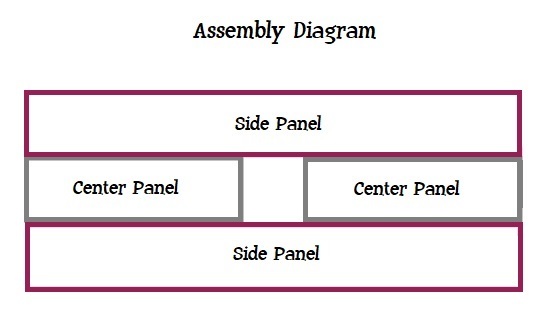 See Assembly Diagram, below. With MC and tapestry needle sew through edges of side and center panels with a running st or back st to secure together. Row 1: With RS facing, using MC, dc evenly along one short edge, any odd number of dc sts that lays nicely will work, turn. Row 2: Ch 2 (does not count as a st), hdc in first st, *Bpdc in next st, hdc in next st, repeat from * across, turn. Row 3: Ch 2, hdc in first st *Fpdc in next st, hdc in next st, repeat from * across, turn. Repeat Rows 1-4 for second short edge. Then repeat for each long edge, including along the sides of the ribbed edging you’ve already made. I found that it worked well for me to have 5 dc for every 4 row ends. Rnd 1: With RS facing, using MC, join with sc to center ch sp of 3rd fan of back center panel, sc in next st, sc in next ch sp, ch 2, sk 3 sts, (sc in next ch sp, sc in next st)2 times, sc in next ch sp, ch 1, sc evenly across side of neckline, ch 1, *(sc in next ch sp, sc in next st)2 times, sc in next ch sp**, ch 2, sk 3 sts, repeat from * across front center panel to last 2 sts, ch 1, sc evenly across side of neckline, ch 1, repeat from first * to second * across back center panel until you get back to where you started, join to first st with sl st, turn – approx. 60 sts. Rnd 1: With RS facing, using MC, join with sc to center ch sp of 2nd [3rd, 3rd] complete fan of back center panel, sc in next st, sc in next ch sp, ch 2, sk 3 sts, (sc in next ch sp, sc in next st)2 times, sc in next ch sp, ch 2, sk 3 sts, sc in next ch sp, sc in next st, sc evenly across side of neckline, sk first st of front center panel (which should be underneath side panel anyhow), sc in next st, sc in next ch sp, *ch 2, sk 3 sts**, (sc in next ch sp, sc in next st)2 times, sc in next ch sp, repeat from * across front center panel, ending last repeat at **, sc in next ch sp, sc in next st, sc evenly across side of neckline, sk first st of back center panel, sc in next st, sc in next ch sp, repeat from first * to second * across back center panel until you get back to where you started, join to first st with sl st, turn – approx. 58 sts. Rnd 2: Ch 2 (does not count as a st), dc evenly around neckline, aiming for 93 or an odd number close to that (if the intended wearer has an especially large head, you could make it just a little larger), join to first st with sl st, turn. Rnd 3: Ch 2, Fpdc in first st, *Bpdc in next st, Fpdc in next st, repeat from * around, join to first st with sl st, turn. Rnd 4: Ch 2, Bpdc in first st, *Fpdc in next st, Bpdc in next st, repeat from * around, join to first st with sl st, turn. Rnds 5-7:Alternate repeating Rnds 3-4, ending with a Rnd 3 repeat. Fasten off. Place poncho RS out, folded in half as it will be worn. One set of buttons will go on the left side, and one set on the right side. Buttons are attached through both thicknesses of the poncho, one on the front, and one on the back. Place buttons a little less than halfway up from the bottom of the poncho, centered on the ribbed edging. With tapestry needle and MC, sew on buttons. Weave in all ends. 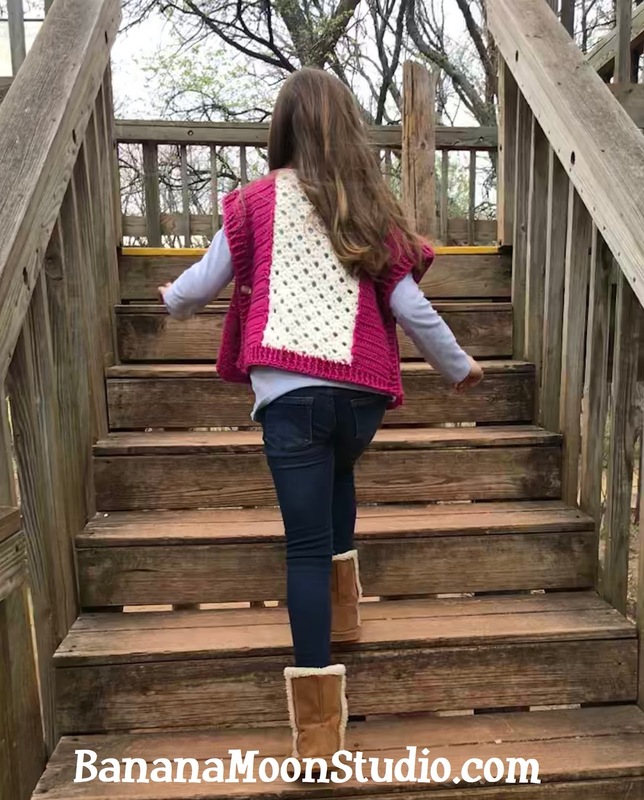 I hope you’ll share photos of your finished projects with me! You can post your project on Ravelry, share your photos with me on Facebook, or share them on Instagram and tag me! It makes my day when someone has used and enjoyed my pattern! If, by chance, you find a mistake, since I am human, please let me know, and I will fix it! Sparkly fingerless mitts! Trust me, my girls LOVE these! 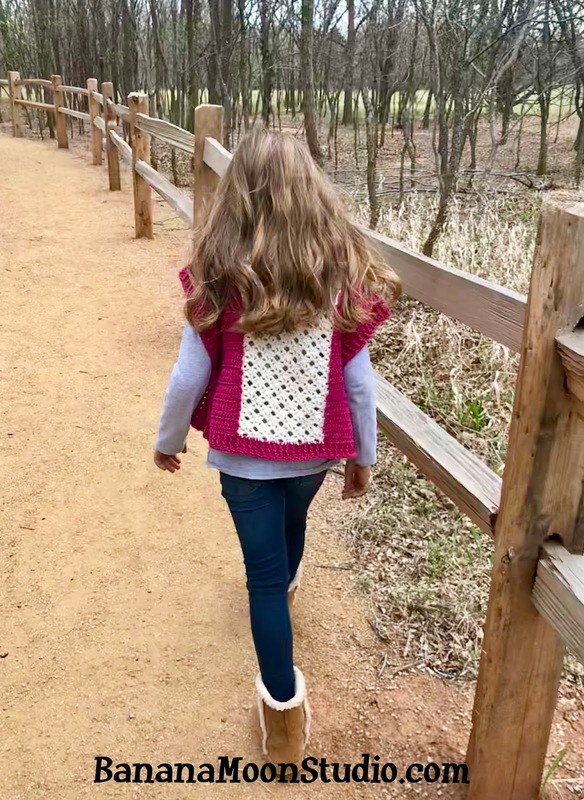 This darling openwork jacket will be a fun accessory! She’ll adore this jumper with subtle cables and a lacy edging!